A man who died in police custody could have swallowed cocaine after being arrested for shoplifting, an inquest has heard. Lee Sparks, 29, died on 24 December 2015 at West Suffolk Hospital. 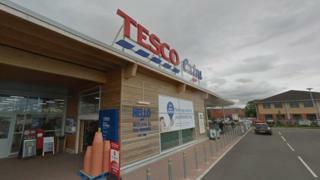 Jurors were shown footage of Mr Sparks being detained at Tesco in Newmarket before he was arrested by police. Suffolk assistant coroner Jacqueline Devonish asked them to consider whether Mr Sparks had swallowed the drugs while being taken to a police station. Mr Sparks, from Icklingham in Suffolk, was confronted by staff who believed he was shoplifting, and CCTV footage showed staff and shoppers holding him down on the store's welcome mat until police arrived. He was arrested at 18:10 GMT but began to feel unwell just an hour later. Mr Sparks told police at Bury St Edmunds investigation centre he had swallowed cocaine, and was taken to West Suffolk Hospital, where he died at 23:00. Following Mr Sparks' death, an inquiry was opened by the Independent Office for Police Conduct. The inquest heard searches of Mr Sparks - at the supermarket and police station - had failed to yield any drugs. Mr Sparks was known to use drugs including heroin, valium and cannabis as well as drinking alcohol, according to his GP. His father Trevor Sparks said in a statement he believed his son's drug issues had developed as a result of finding a close friend hanged. "I don't think he ever really recovered from that," he said. "I always knew that he would not live to a ripe old age, but I never thought I would lose him like that." The inquest, due to last two weeks, continues.